Exhibitions take several years to put together. It all begins with an idea. 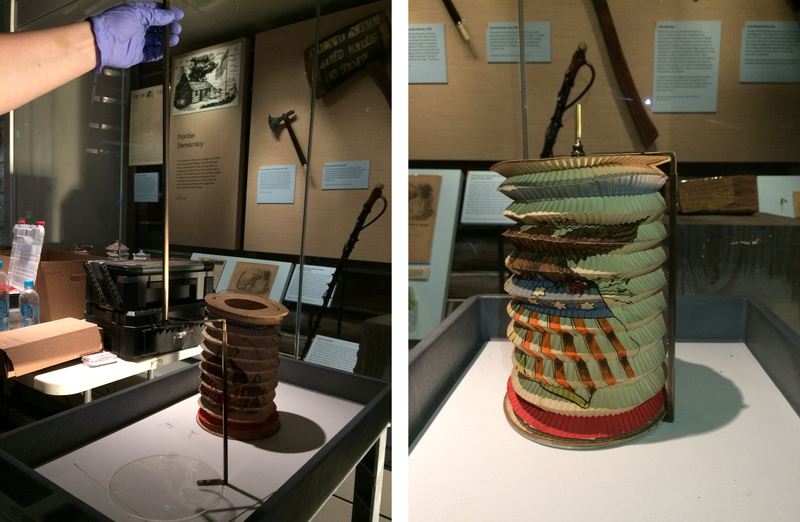 Objects are selected, researched, and conserved. Scripts are written, edited, and re-written. A design team uses those ideas to create a drawing of the proposed exhibition. When a final design is reached, then the exhibition can be built. Walls are put up and cases are constructed. Only then can curators and collections managers begin actual object installation. Before anything was built for the exhibition American Democracy: A Great Leap of Faith, which opened on June 28, 2017, the team had been working for almost five years. Larger exhibitions such as American Democracy (AD) take several months to install. AD has almost 900 objects, and each one of those objects needs to be individually mounted (see number seven for more on that), installed, and then lit. This process can take anywhere from minutes to hours for each object depending on how complicated the requirements of the object and design are. Installation can be demanding. You are standing, walking, lifting, bending, reaching, and climbing ladders. 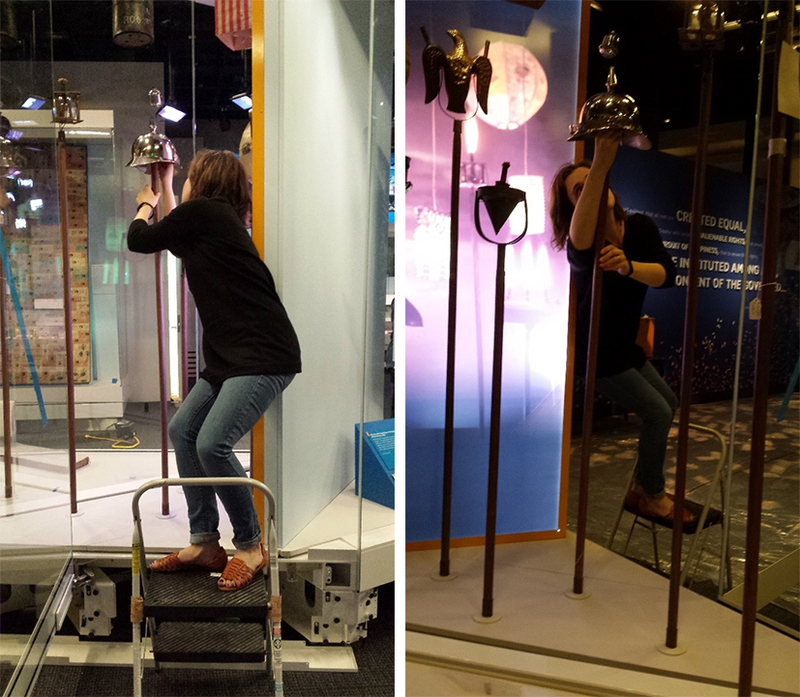 We easily can take over 10,000 steps on any given day of exhibition installation (we know because we've tracked it!). Working in small cases and maneuvering around case furniture can require some interesting gymnastics. For instance, when we installed the woman suffrage wagon (the very first object that went in the exhibition) we had to lie on the floor underneath it while it was placed to ensure it was in proper position and safely on its jacks (we truly see the exhibition from all angles!). In addition to the physical demands, it can also be mentally taxing. A collections manager has to know the objects well to be able to care for them properly, which means knowing what each object is, what it is made of, how to handle it appropriately, and if it needs any particular special care. You have to know the exhibition design to follow which objects go in which cases. And if a certain case is not ready to be installed, you have to be able to continue to move forward; with an opening date already set, you can't sit and wait. There is a lot of thinking on your tired feet. While some objects can be displayed simply sitting on the case bottom, many require specialized mounts to position them safely in the case and allow for optimum viewing. Highly skilled mountmakers fabricate custom mounts for each specific object, and they are often so carefully crafted as to blend seamlessly with the object. The type of mount fabricated is based on the design layout for how the object is to be displayed along with the conservation and support needs of each particular object. Mountmakers work with curators, conservators, and collections managers to determine the best mount for each object and then meticulously craft each piece, measuring and testing it multiple times to ensure a perfect fit. It requires a great amount of attention to detail, but the result is that a good mount is a piece of artwork in itself. Exhibition spaces are generally dark because light is damaging. Light causes things to fade and become brittle. However, it isn't worth putting objects on view if there isn't enough light to see them! Curators, collections managers, and conservators determine how much light an object can tolerate before incurring damage (measured in foot candles, a measurement of light intensity equal to the amount of light given off by one candle at a distance of one foot). Armed with that information, a team of lighting designers very carefully light each object in order to balance care for the object with public visibility. Lighting can set the tone for the exhibition as well, from creating a lively environment to a more subdued tone depending on the subject matter, similar to theater stage lighting (in fact many of the lighting designers we've worked with have backgrounds in stage lighting). When the house lights go off and exhibition-specific lighting is all that remains, not only are the objects better cared for, but the setting takes on a hushed, almost reverential feeling that emphasizes the importance of the objects themselves. We often joke to friends and family that we don't do math because we are history people. But much to our dismay, we do have to do math. We have to give accurate measurements to the exhibition designers who must design the cases to the correct dimensions. We also have to be able to calculate square footage. We have to figure out how to center something of X size within a given space (Bethanee in particular does not have a natural affinity for this, she claims). Thankfully on this installation we had mountmakers who were skilled at this to take care of most of the cases. However, in the long campaign cases we refer to as our "gimmicks cases" we had to figure out how to fit over 400 objects into 24.25 linear feet. It took several team members many hours of creating layouts to get that just right! Places we never expected to find ourselves on the job but did: At the top of a 12 foot ladder. Underneath a case. Inside a case. Crawling through a hole in the wall. Covered in dust from cleaning. Pulling mannequins on a flatbed. Lifting an 80-pound glass case cover. Driving a pallet jack. Using glass cups (think suction cups with handles that we use to open cases). Between the two of us, we've worked on at least 10 exhibition installations out of the Division of Political History, and no two have been quite alike. The basis of each installation is the same, but each has its own unique set of circumstances. They are different not only because of who you work with, but because the objects are different. For example, a costume-heavy exhibition has different needs than American Democracy, which is mostly paper and 3D objects. The different objects require different mounts, different lighting, and different conservation techniques. Putting up an exhibition in time for a target opening date can require a lot of long, intense days, but it is also really, really fun. We work very closely with the entire exhibition crew (which includes case fabricators, conservators, construction teams, mountmakers, security, lighting designers, and many, many more) and develop a friendly working relationship. We are all required to work in close proximity, and frequently joke that the somewhat chaotic installation process is like a three-ring circus: mountmakers are installing objects, cases are being lit, and case alarms are being tested. After years of planning, the physical work is a whirlwind. You don't have time to get bored. As crews pack up to go home when opening nears, you get the bittersweet feeling of the end of a school year, a large dose of relief with a side of "I'm going to miss these people and this task." And let's face it, being around objects like Thomas Jefferson's desk and the Great Clock of America never, ever gets old. Even after we've opened the exhibitions to the public, we are never truly done. We periodically rotate light-sensitive objects such as textiles and paper so they don't get damaged from too much light exposure. We update sections of exhibitions to keep them current (in American Democracy, especially, we will need to update our campaign section to reflect new political cycles). The curators and museum specialists responsible for the exhibition have to oversee it for its entire lifespan, be it six months or 20 years, and caring for it physically and intellectually doesn't end until it's de-installed. But de-installation is another story. Sara Murphy and Bethanee Bemis are museum specialists and collections managers in the Division of Political History.